A record breaking cold snap is descending on the Midwest after a powerful snowstorm blanketed the region. The extreme cold has forced the closure of public schools in Minneapolis, Detroit and Chicago in anticipation of temperatures not seen in a quarter-century. "You’re talking about frostbite and hypothermia issues very quickly, like in a matter of minutes, maybe seconds," said meteorologist Brian Hurley with the Weather Prediction Center, who notes that forecasted temperatures will hit "40 degrees below normal." President Trump tweeted on Tuesday: "In the beautiful Midwest, windchill temperatures are reaching minus 60 degrees, the coldest ever recorded. In coming days, expected to get even colder. People can’t last outside even for minutes. What the hell is going on with Global Waming? Please come back fast, we need you!" 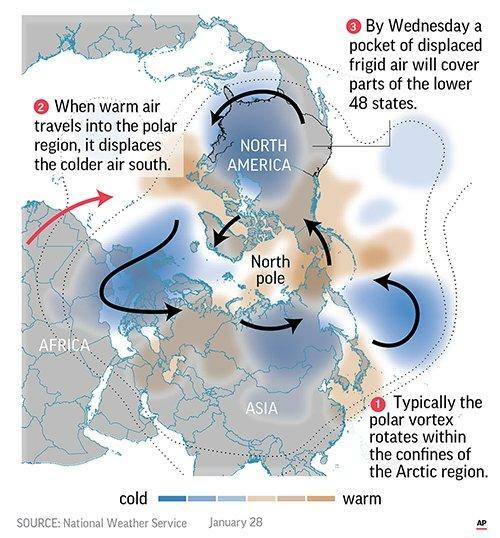 The cold snap is being blamed on a polar vortex, after a blast of hot air from Morocco suddenly warmed the north pole, splitting the polar vortex into pieces which began to "wander" south, according to storm expert Judah Cohen. High temps today across Canada and the upper midwest of the US didn’t reach Mars last reported high. I'm taking the plunge on the telly this evening using a graphic to show Sudden Stratospheric Warming and a split Polar Vortex! This can sometimes have a big impact on our weather down the line! Chicago's Brookfield Zoo will be closed on Wednesday and Thursday - the fourth time in its 85-year history. 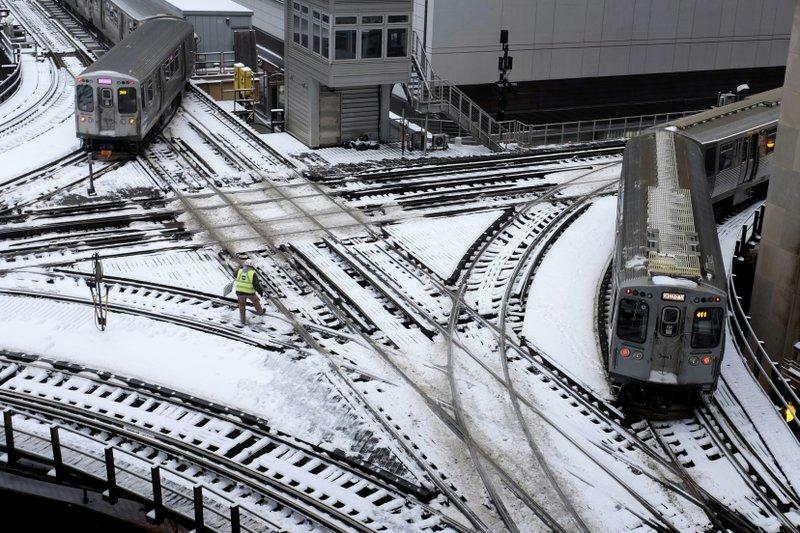 Meanwhile, temperatures at O'Hare International Airport in Chicago are expected to top out oat negative 14 degrees, which would break a January 18, 1994 record. The governors of Wisconsin and Michigan have declared states of emergency in advance of the cold snaps, while cold weather advisories remain in effect across a large region of the central US, from Ohio to North Dakota. Temperatures will fall as much as 20 degrees below average in the Upper Mississippi Valley and Upper Great Lakes region.